Learn about the programs that contribute to our unique and interactive environment! “A young child should hear 30,000 words each day to develop strong language and reading skills.” Attend one of our happy Storyplays and play your way to 30,000 words! Baby Wordplay Theaters are neighborhood story and song spaces. Our family centers foster early literacy for little ones, through reading, singing and playing in a language-rich environment. 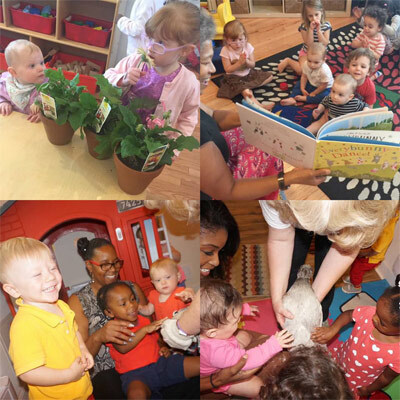 We conduct daily storyplays with books, songs, finger-plays, puppets, movement, live music, sign language and more. We model for parents and caregivers how to read, sing and bond with their children through books and music. The TAG TEAM staff are very special instructors. All come to the program with sincere interest in seeing children progress and prepare for a successful launch into fitness…and love it! Loving it is what propels us to stay active. Our diverse curriculum incorporates fundamentals of gymnastics development; age appropriate discussions about nutrition woven into themed lessons; and unique sport units that make connections from key patterns that are learned in gymnastics and apply to ALL sport movement patterns. • Older children have the opportunity to serve as mentors and to take leadership roles. • Children are more likely to cooperate than compete. The spirit of cooperation and caring makes it possible for children to help each other as individuals, not see each other as competitors. • Older children model more sophisticated approaches to problem solving, and younger children are able to accomplish tasks they could not do without the assistance of older children. This dynamic increases the older child’s level of independence and competence. • Children develop a sense of family with their classmates. They become a “family of learners” who support and care for each other.